More than two years after Rina Hernandez was rescued from human trafficking from a Middle Eastern family, life has quieted down a little bit for this former school teacher. She now lives in Queens secure in her resolved immigration status and has worked job to job to get by. Some days are hard because her employment is mostly part-time and short-lived. 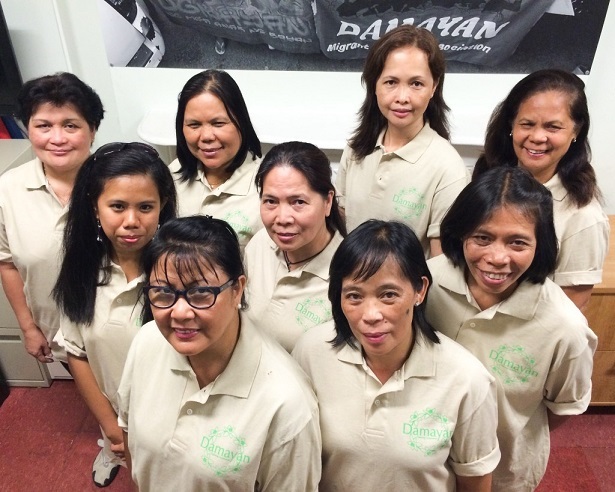 Now comes the Damayan Cleaning Cooperative, the first Filipina migrant worker-owned cooperative in the United States. It launched on September 27 with the support of the Center for Family Life in Sunset Park. It was founded by nine women as a cooperative, offering cleaning services to homes and offices. Rina is one of the founding members. “Please join us in celebration…as we launch our business Damayan Cleaning Cooperative,” wrote Rina to this reporter, inviting The FilAm to a walk-a-thon to drum up support for the coop’s effort to provide members access to “meaningful and stable” jobs. “We are proud to launch our cooperative. Through dedication and hard work, we are creating a business that is owned by the members – Filipina migrant workers. We are excited to create this business not just for the members, but to create more decent jobs for our community,” said Annie Bello, another founding member. Over the last nine months, nine socially committed women — experienced cleaners and community leaders — developed the worker cleaning cooperative business, including creating cleaning protocols, implementing democratic decision-making processes, and planning their business structure, Damayan said in a statement. Their services include: Dusting and polishing, including desktops, shelves, door frames and air vents; Spot cleaning; Sweeping, vacuuming and mopping; Light fixture, appliance and wall hanging cleaning; Trash/recycling removal; Glass and interior window cleaning; Bathroom sanitizing and replenishment of supplies; Kitchen, conference room, copy room, lounge, stairway and reception area cleaning; Plant watering; and Special event cleaning. The cooperative was developed as a collaboration between Damayan Migrant Workers Association, a grassroots organization for the rights of low-wage Filipino migrant workers, and the Center for Family Life, a family and social services organization that has been partnering with residents to organize cooperative businesses in immigrant communities since 2006.